The Creamy Peach Talea Roses are a stunning soft peach rose with peachy tones throughout. The classic shape and colorings create a timeless event! 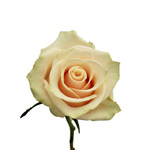 This unique rose is available in quantities of 50 and 75 for your focal arrangements! Unless otherwise indicated, rose stem length will be a minimum of 40 cm or 15.5 inches. Roses are shipped 25 stem bunches. 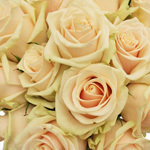 Within each bunch, the roses are packed in two layers to ensure protection during shipping. 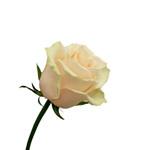 From the top angle, it will appear that you only have 12 rose stems in the bunch; however, below this layer there is a second layer containing the remaining 13 roses. 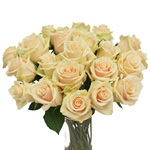 We ship our roses with guard petals intact to protect the roses while travelling and might cause the rose to look distorted, discolored and/or bruised. Once you are ready to process your roses, you may need to remove up to 8 guard petals per rose to reveal the pristine quality rose bloom. Expected vase life is an average of 5-8 days. Imported directly from our Ecuadorian or Colombian partner flower farms.